Chiral materials have been studied in the Department of Chemistry at the University of Virginia for applications in areas like asymmetric catalysis, enantioselective fluorescent sensing, and optical/electrical materials. Optically active 1,1'-binaphthyl molecules are used to build novel chiral polymers, dendrimers, macrocycles, and acyclic molecules. 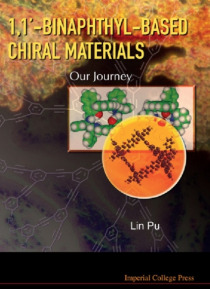 1,1'-Binaphthyl molecules are chosen because of… their remarkably stable chiral configuration as well as their high asymmetric inductions in many processes.In this book, both the fundamental knowledge about the 1,1'-binaphthyl molecules and the synthesis of the structurally diverse 1,1'-binaphthyl-based materials are described. The applications of these materials in various fields are also discussed. This book will serve as a reference for graduate students as well as other professionals working in the related fields.